Have you ever worried about your iPhone/iPod Touch Battery? We all have. Now you don’t have to worry about that anymore. iBattery Manager Pro – Ultimate Battery App is the most advance battery application inside App store with some of great features like Battery Management, Battery Maintenance, calibration Supercharge( helps your battery to get more charge increasing upto 5 % better battery life) and many more as they claimed. Your search for best ALL-IN-1 Battery Management & Maintenance app ends here. 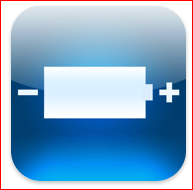 Helps you manage your iPhone/iPod touch battery in most efficient way. If you want to listen music for 2 hours. Press the music button, slide it to 2 hours, now you can see how much battery will be left after you listen music for 2 hours. Great use when you are generally out. Tells you current battery percentage and remaining time of talk 2G, talk3G, standby, video, audio, internet 3g, internet wifi, game, game 3D. You will be notified with alert sound when your battery get full charged. There are 6 different alert sound to choose from. It also supports alert repetition so that you never miss the alert. Tells you remaining time to recharge when connected to power cable/usb cable. Did u Upgrade your notebook to Windows 7 & getting battery issue? Windows 7 makes use of a feature of modern laptop batteries which have circuitry and firmware that can report to Windows the overall health of the battery. This is reported in absolute terms as Watt-hours power capacity. Windows 7 then does a simple calculation to determine a percentage of degradation from the original design capacity. The Windows 7 the notification is a battery meter icon and notification with a message “Consider replacing your battery”. This notification is new to Windows 7 and not available in Windows Vista or XP. There have been reports that after upgrading to Windows 7, users received this message, even if they had a new battery installed! This article may interest users who are receiving this message on their LG laptops. and this warning is displayed even if a new battery is inserted into the laptop, then a BIOS update may help you. This problem occurs because of a code defect in the system firmware (BIOS) of some LG notebooks. These include the R500 family of notebooks. The Advanced Configuration and Power Interface (ACPI) firmware does not correctly initialize and report the Design Capacity field of the static battery information structure that is retrieved by using the _BIF method. Therefore, the Design Capacity that is reported to Windows may be much larger than the Last Full Charge capacity that is also reported in the static battery information structure. The Windows Battery Meter divides the Last Full Charge capacity by the Design Capacity to determine battery health. The Windows Battery Meter displays the “Consider replacing your battery” message when the Last Full Charge Capacity is less than 40% of the Design Capacity. When this issue occurs, the Design Capacity is reported as much larger than Last Full Charge capacity. Therefore, the “Consider replacing your battery” message is always shown. Today, Apple posted two pages — one dedicated to the iPod and one to the iPhone — to help users get the most from their battery. Because of its different features, the iPhone has its own set of tips that include minimizing use of location services; turning off push notifications; auto-check fewer email accounts; use Airplane Mode in low- or no-coverage areas; adjust brightness; and turning off 3G. Basically, if you read and apply our tips you are good to go, but it is always nice to see that after 3 years full of complaints, Apple posts some official tips.